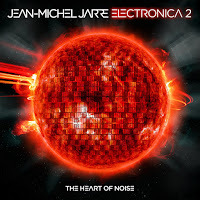 The Guardian Newspaper are holding a 60 minute evening talk with Jean Michel Jarre in London on Wednesday 4th May 2016, "about his life and extraordinary career", ahead of the release of his new Studio Album 'ELECTRONICA 2: THE HEART OF NOISE', scheduled to be released on Friday 6th May 2016. "One of the undisputed founding fathers of electronic music, Jarre has bridged the gap between critical and commercial success for almost half a century. Celebrated for his experimental electronic compositions, legendary live shows (including the largest ever gig on earth), he'll discuss his music, influences and upcoming new work." says The Guardian. The event takes place at Kings Place, 90 York Way, London, N1 9AG, from 19:00-20:00 BST on Wednesday 4th May 2016. Tickets cost £15.00 each (plus a £1.11 booking fee), with concessions available. "Wheelchair users and visitors who require an assistant may bring a companion free of charge. To book a free companion ticket please email guardianlive.events@theguardian.com." For further information, please visit The Guardian Members Website or Click Here. JARRE UK would like to thank Vienna Macleod at The Guardian for this information.